New federal data this week appear to show resegregation of U.S. schools is on the rise. A report from the Government Accountability Office says the number of schools serving mostly poor African-American and Hispanic students has more than doubled in the last decade and a half. The report comes 62 years to the day after the Brown v. Board of Education decision that found segregated schools unconstitutional. Many say this new data point to the work still needed after all this time; just days ago, a federal judge ordered a Mississippi school district to desegregate, following a five-decade-long legal battle. Sixty-two years after Brown v. Board of Education, a look at how the country is addressing segregation of U.S. schools. MS. ALLISON AUBREYThanks for joining us. I'm Allison Aubrey of NPR News sitting in for Diane Rehm. On May 17, 1954, the Supreme Court of the United States declared segregated schools unconstitutional. The historic Brown v. Board of Education decision began breaking down racial divisions in many communities, but today, 62 years later, new data affirm the concerns of many, schools are moving back in the wrong direction. MS. ALLISON AUBREYIn recent years, African-American and Hispanic children have become more and more isolated from their more affluent white peers in U.S. public schools. Here to talk about why and possible solutions, Emma Brown of The Washington Post and Gerard Robinson of The American Enterprise Institute. By phone from Baltimore is Sherrilyn Ifill of the NAACP Legal Defense and Educational Fund and by phone from Wellfleet, Massachusetts, is Richard Rothstein of the Economic Policy Institute. Welcome to the program, all of you. MS. SHERRILYN IFILLThank you so much. AUBREYSo we also -- yes, great to have you. We also want to hear from you, our listeners, this hour so give us a call, 800-433-8850, or send us an email to drshow@wamu.org. You can also find us on Facebook or you can send us a tweet. Emma, I want to start with you. We have new data from the government accountability office about segregation of U.S. schools. What does it say? BROWNYeah, this report that came out on Tuesday had two main points. The first being that schools that are highly segregated by race and class have less access to the full range of courses, especially in math and science. They're also more likely to use expulsion and suspension with students. And then, the second point, which was, I think, what grabbed a lot of attention was that the number of these highly segregated schools, so these are schools where more than three-quarters of students are low income, more than three-quarters of students are black or Hispanic, has grown dramatically over the last decade. BROWNSo from 2001 to 20014, the number of the schools more than doubled from about 7,000 to about 15,000. And the proportion of them also nearly doubled from 9 to 16 percent of our nation's schools. AUBREYSo a big growth there. Sherrilyn Ifill, what is your reaction to this new data? IFILL...I'm certainly not surprised by the data. Obviously, we litigated the Brown v. Board of Education case and have been engaged in more than 100 desegregation cases over the course of the 62 years since that case. We continue to litigate desegregation cases in the south. And we also understand the complicated nature of segregation. I mean, people look at the data that came out from this very excellent and important GAO report and from other studies that have been released and say, how can we be going backwards? IFILLWell, we've been ringing the bell on this for some time and I think what the GAO report has done has began to highlight what we need to be doing if we want to deal with the fact that our education system has become resegregated not only by race, but also by socioeconomic income and that the outcome for students in highly segregated school districts are poor. I would say that it's also time, and I wrote about this this week in a piece on CNN.com, that it's also time for us to talk about the damage that is done to white children by attending segregated schools as well. IFILLIn terms of what this country needs for our education system going forward and to build tomorrow's citizens, we need to finally tackle this problem and that means dealing with housing segregation and transportation and economic infrastructure and, of course, matters solely related to education and education funding as well. AUBREYGerard Robinson, you have a different take. Tell us what you make of this report. ROBINSONThe report had three goals. One was to identify the percentage of students who are poor, black and Hispanic. Second was to identify what states and school systems are doing to achieve racial diversity and third is to identify the role of the Department of Education and the Department of Justice in addressing issues of discrimination. On that standpoint, they provided a wealth of information. I do believe that 62 years later, American education and opportunity is better than what it was during the era of Jim Crow. ROBINSONI will say that I still find it interesting that we use the term segregation. We don't have segregated schools in the U.S. today in terms of how we had in '54. I call those schools racially identifiable schools because that's what they are. If we want to make sure that kids who go to schools where 75 percent of the students are black or Hispanic, we call that segregated. For the last 62 years, when the white schools were the same, we didn't call them schools segregation or segregated academies. ROBINSONSo I think what we need to do is change our language and to not put the onus traditionally on black and brown communities to be the one to make this work, but to also understand the government can only do so much in trying to coerce people to live together, to go to school together and that we should give people an opportunity to learn where they are and so for me, good information. It wasn't strong on solutions, but, again, that wasn't the focus of the paper. AUBREYAnd Richard Rothstein, who's joining us on Skype as well, this conversation does not actually begin with schools and education, you say. Explain that. ROTHSTEINYes. I have somewhat different take on this report. This report, for some puzzling reason, combines the share of students who are in schools that are high minority and the share of students who are in schools where a lot of children are poor. And it concludes that because that combined number has increased, that we have increased segregation. In fact, the main thing that's driving the increase of those numbers over the last 10 years is an increase in poverty. ROTHSTEINYou can have exactly the same share of children who are of the same race in the school, no change in segregation, but this number would've increased because we have more and more children in poverty. In fact, over the last 10 years of the period that this report covers, the share of families in poverty in this country has gone from 10 percent to 13 percent. So that's what's driving this number and that's an economic problem. It's not a social problem. It's not an educational problem. ROTHSTEINThe onus is placed on the Department of Education, but there's very little the Department of Education can do about that. Now, a couple of days ago, for example, the Department of Labor issued a new rule, entitling of people who are so-called supervisors making poverty wages to overtime. If that rule had been in place a couple of years ago, a large number of children who are now eligible for free lunch and are being shown as being low income in this report would no longer be low income because their parents would have gained a significant boost in income above the poverty line and no longer be in that category. ROTHSTEINSo we have to focus on the greater economic inequality that's driving these numbers. Labor market policies are the way to solve, like the overtime rule. We're trying to raise minimum wages across the country. That's the thing that's driving the numbers in this report. Now, of course, segregation is very high. Racial segregation is very high. It's been high -- it's higher in this generation than it was 40 years ago after we -- when we attempted to really integrate schools. But the increase hasn't been much in the last 10 years. ROTHSTEINWhat's driving it in the last 10 years is economic inequality. If -- and I agree with Gerald (sic), the reason that we have segregated schools today is that we have schools that are in segregated neighborhoods. And that's also not an education problem. That's a housing problem. And unless we deal with the underlying issue of housing segregation in this country, we're going to continue to have segregated schools. Let me just make one observation, the final. ROTHSTEINWhen Thurgood Marshall won the Supreme Court decision 62 years ago, he had a press conference the next day. And in that press conference he said, okay, now we've won school segregation decision, we're gonna desegregate schools. Now, we're going to turn our attention to housing. And in fact, the civil rights community was never able to turn its attention to housing because there was such massive resistance from the school decision. But if we had litigated back then, before the massive suburbanization of white working class families, if we had litigated housing segregation at that time, we would've accomplished much more for school segregation than we have by trying to focus on schools alone. AUBREYGot it. So the proportion of kids attending high poverty schools has gone up because poverty has gone up. Emma, turning back to you, does this report itself give us any sense of the why here? Does it point any fingers beyond what Richard Rothstein just said? BROWNSo it doesn't give us a whole lot of the why. It does talk about the broad demographic changes in our nation, including the rising poverty among our school children. More than half of school children in America now receive or reduced-price lunch, for example. And there has been a huge increase in the number of Latino students that has also, you know, really changed the face of our school children. But other than that, it looks at the Department of Justice and the Department of Education and sort of urges both departments to do more, as far as using the powers they do have to enforce the laws of the country. BROWNAnd, in particular, says that just could do a better job systematically monitoring the 178 open desegregation cases that are still pending and says that, you know, that they're not doing a great job. Justice pushed back against that in their response to the report, but that is one thing that the GAO pointed out. AUBREYSherrilyn Ifill, the point here that the Department of Justice could be doing more? AUBREYAnd we'll get back to that in just minute. Yeah. We'll get back to that in just a minute. Stay with us. More of our conversation coming up after a short break. I'm Allison Aubrey of NPR News sitting in for Diane Rehm. AUBREYWelcome back. I'm Allison Aubrey of NPR News sitting in for Diane Rehm. I'm joined in the studio this hour by Gerard Robinson, resident fellow of the American Enterprise Institute, Emma Brown national education reporter for The Washington Post. One the phone, Sherrilyn Ifill of the NAACP Legal Defense and Educational Fund. And by phone from Wellesley, Mass., Richard Rothstein of the Economic Policy Institute. AUBREYI'm going to open the phones here. We're going to take a call from Eric in St. Louis, Mo. Eric, you're on the air. ERICHi. Hey, I wanted to say that I grew up in Topeka, Kan. And I grew up on the west side, this is after the Brown case went into effect. And in my little elementary school, in my class, there was one black girl. And she was one of the smartest people in the class. And it never occurred to me that there would be any reason why somebody like that would have to be forced to walk 20 blocks out of her way to go to an all-black school, which had been the case years before. ERICBut what I wanted to say was that, since that time, I think another -- well, what I really want to say is, why is there one girl who did so well in class and not a lot of other black students? It was because most of the black people in Topeka lived on the east side. So her being in my class was an indication of socioeconomic status. She was from the middle class. And what I really want to say is this whole issue, to repeat what you've all been saying, is more an issue of socioeconomic status. And it -- if it really were a case that you could correct this problem by shifting people around in schools and busing, then I think, over the years, it would have -- we would have seen much more correction of the problem than we have. AUBREYThank you so much for your call. Gerard Robinson, your thoughts on this? ROBINSONSo I grew up in Los Angeles, a kid in the 1970s. I remember a number of my friends who were bused to the Valley to attend a magnet school. And I said, well, why are you going there. And they said because my mom and dad say we'll get a better education there. And for some of the kids it worked out really well. They graduated from high school. Some went to the college, some went to the military, others went to regular college. But for a lot of others it did not. ROBINSONWhat it did for me in the '70s and even now reading the report is, when we began to invest money as well as human resources in schools, sometimes we sent a very interesting message to the kids we were trying to help. Your school and your neighborhood is a failure, therefore we have to send you out. Or, if you have a failing school and a bad neighborhood school, they were going to bus white people in. The real message should be, let's educate the children we have now not the children we wish we would have had or would have today. ROBINSONAnd so I still think busing, there's a role for that. I believe there's also some pretty good examples of economic integration where it works. And I always remind people, look at Boston. They have the second oldest voluntary integration program in the country called METCO. And I think it's one place to look. AUBREYRichard Rothstein, your thoughts here. Back to your Thurgood Marshall remark, focus on housing. Kids go to a school in the zip code they live in and that's why we're seeing what we see. ROTHSTEINYes. But the zip code they live in is not an accident. The zip code they live in is the result of, most of the 20th century, government policies that were designed to segregate the country residentially. And, of course, once you segregate the country residentially, you get segregated schools, because schools -- children go to schools in their neighborhoods. In the mid-20th century, the federal government created suburbs and prohibited African-Americans from buying into those suburbs. They subsidized whites to move into those suburbs. And as a result, you got segregated metropolitan areas that hadn't existed before. ROTHSTEINToday, we continue to have federal housing policies that perpetuate segregation. And, for example, we have a program that you're probably familiar with, it's called the Section 8 program, the housing choice voucher program, technically. That program is used primarily to place families who get -- these are working families often, families whose incomes are too low to afford to rent apartments at market rates. It's used primarily to place families in already segregated neighborhoods. So, of course, the children go to segregated schools. ROTHSTEINWe have examples in this country of experiments where they used these vouchers to place children in middle-class neighborhoods. When they do that, the children go to middle-class schools, to integrated schools, and they do much better. We have another program that the federal government runs out of the Treasury Department, they give tax credits to developers who develop housing for low and moderate income families. Those projects are primarily placed in already-segregated neighborhoods. If they were place in middle-class neighborhoods and we had integrated neighborhoods, those children would go to integrated schools. ROTHSTEINSo the only way to -- and of course we can do some desegregation on the margins, some magnet schools we can adjust attendance boundaries at borderline areas. But the vast majority of children in this country who are segregated by race, are segregated because they live too far from neighborhoods where the other race lives to have meaningful integration. So unless we tackle these housing issues and enact active policies to desegregate the neighborhoods of this country, we're going to have the segregated schools for many, many years to come. AUBREYWe have an email here from Paul in Farmington Hills, Mich. He says, charter schools drain resources from the public school system, drain high-achieving students from public schools and drain motivated and involved parents from public schools. Sherrilyn Ifill, do you want to weigh in on this? IFILLWell, charter schools can do all those things. But we should remember that 90 percent of students attend regular schools, only 7 percent attend charter schools. And so, while charter schools have their problems and their challenges, they are not the crux of the problem. I want to make sure that we're very clear that, in addition to all of the issues that have been raised, that there are true, active issues related to education and how we have managed education policy and law that have produced the outcomes we see today. IFILLYes, part of it is housing. Yes, part of it is the economic infrastructure in communities. But it's also true that the Supreme Court issued two decisions that essentially shaped the future of segregated education in this country in the 1970s. Two of those decisions -- those two decisions came in 1974. One was a case called Millikan v. Bradley in the Detroit, Mich., area, where the Supreme Court held that you could not engage in integration plans that crossed district lines. That essentially meant that if populations engaged in white flight -- which happened all over this country after the Brown decision -- whites could be assure that they were -- if they moved to the suburbs, they would not be included in integration plans that were created in the cities. IFILLThe second decision was a case called Rodriguez v. San Antonio Independent School District, in which the Supreme Court affirmed the ability to use property taxes as the basis for school funding. And that decision ensured that the kind of economic dislocation and poverty that Richard Rothstein is talking about would determine the educational outcome for students. We don't have to use property taxes to fund education, but we do. Which necessarily means that when you live in an economically depressed area, your school is, by virtue of that rule, going to have fewer resources, going to have fewer opportunities for students than a neighboring school district that has wealthier students. IFILLSo we're got to begin to look not only at the economic infrastructure and housing issues, but also about education law and policy that has driven the outcomes that we see in the GAO report. AUBREYWe have a tweet from Ted. He says, school choice programs would help most. In a free society there is only so much government can do regarding voluntary housing segregation. Gerard Robinson. ROBINSONSchool choice has had a mixed history in the United States. After the Brown decision, when there was a major push for massive resistance, there were a number of Southern states -- my home state of Virginia being one -- who instituted tuition tax grants, what they called tuition grants. And they were basically public money used to create segregated academies throughout the South. The U.S. Commission on Civil Rights identified that in the 1960s that in the absence of a tuition-grant program, the private school movement in Mississippi and Louisiana would have been pretty much nonexistent, would have had some but not to the same level. ROBINSONWell, that was in the '60s. You had a number of cases, particularly the work under the NAACP Legal Defense Fund, Oliver Hill, Constance Baker Motley and others, who by 1969 addressed a number of those issues. Fast forward to 1990, we have a new private school choice movement, one focused on equity and liberty and where there's research from Paul Patrick Wolf or Jay Greene, or even Ben Scafidi, an economist at Kennesaw State in the Atlanta are, they've show more integration for children who are in choice programs. And even here in D.C. there are students who are in the voucher program that are in more integrated schools than they would have been had they remained in a public school. AUBREYWe have a call here from Matt in Plano, Texas. Matt, you are on the air. MATTHi. Thank you. I just wanted to make a comment. One of your guests talked earlier about housing. You know, I live in a pretty affluent suburb of Dallas. And one of the things the council or some of the members of the council have railed against was what they call high-density housing. You know, our city has basically grown and it's reached its capacity but it's -- so it's starting to change. A lot of people there do not want to see more apartments, do not want to see more high-density housing, which in my view is a way to keep out lower-income folks, because they don't want to see a lot of affordable housing for two reasons. One, because they think it lowers their property values, but, two, they think it will potentially overcrowd schools. MATTIf you bring those -- if you want to give lower-income families a choice, give them more options where they can live. And if people cannot afford to live in communities like mine with great schools, great school programs, there's no way you're going to break desegregation. So I think that's the main issue is they're trying to price people out of cities like mine, where there's great schools and great career opportunities. AUBREYThank you so much for that call. So, again, affordable housing and how that plays in to schools. Do you want to weigh in on this, Gerard? Or, Emma, you can weigh in as well. BROWNWell, I think, you know, the -- yes, I think your caller is correct that there is -- there are sometimes resistance to high-density housing, to affordable housing in more affluent communities and that that does end up -- when those -- when communities are divided, that shows up in the schools. Any educator will tell you that when you have a classroom with a high concentration of children who are in poverty, they have so many more needs that they come in with. And if the school doesn't have the resources to meet those needs, then the teacher's job becomes so much more difficult. And that can then lead to this cycle of teacher turnover, teacher burnout. And so the links between what's happening in housing and what's happening in classrooms are tight. IFILLYeah, I do because I -- yeah, because I think something that's being left out is, you know, they way in which we have to really drill down in this, which is what I was referring to earlier. Yes, there are critical housing issues, particularly in our nation's cities, that account for this entrenched segregation. But when we begin to look at the rural South, you saw this week in Mississippi, a federal judge ordered a school district in western Mississippi, in Bolivar County, to finally be desegregated -- a case that had been litigated by the Justice Department since 1965. IFILLWe just settled a case in St. Martin Parish, Louisiana, with similar issues. And there, it really is not just about housing. It really is about resources for the school district. It's about the maintenance of a separate white school and black school by tradition. It's about disciplinary policies that are disparate between black schools and white schools. And it's about the academic outcomes that flow -- the poor academic outcomes and disparate academic outcomes that flow from those differences. IFILLSo I guess I want to suggest that we've got to be looking at more than one thing. Yes, housing, economic infrastructure, but there are actually educational problems that need to be addressed. And when we move by region into the rural South, we begin to see some of these issues, particularly as it relates to funding for school districts being drawn from property taxes that are critically important and have to be addressed as education policies, not just as housing policies. The two go together but we've got to be doing both at the same time. AUBREYThank you. I'm Allison Aubrey of NPR News. You're listening to "The Diane Rehm Show." If you'd like to join us, give us call, 800-433-8850. Or send us an email to drshow@wamu.org. I want to you, Richard Rothstein. You're waving your hand there. You wanted to weigh in on what Sherrilyn was just saying. She's saying, you know, look at housing, look at infrastructure, yes. But also look at the resources in the schools. ROTHSTEINWell, what I wanted to say, Allison, was I certainly agree that we need to address all of these problems simultaneously. But your caller before said that there's only so much government can do. And this is a common view, that we have this segregated society both in schools and in neighborhoods and there's little that the government can do about it. But, in fact, government quite successfully created this segregation. And if government can create it, it can undo it. ROTHSTEINYour caller from Plano was coming from a -- calling from a town where local government has created a zoning ordinance which makes it virtually impossible for any but the affluent to live in that community. Throughout the mid-20th century, the Federal Housing Administration, when war veterans came home -- black and white war veterans after World War II -- the Federal Housing Administration and the Veterans Administration gave very great subsidies to white war veterans to move to the suburbs developing at that time and denied those subsidies to African Americans. ROTHSTEINSo it's not that the government is powerless. Government has been very, very powerful in creating the segregation that we have today. And it would take some government action to desegregate. AUBREYWe have a call from Dina in Louisville, Ky. She's asking, why spend millions on busing? Dina, you're on the air. AUBREYAnd explain how the busing system works there. DINAWell, what happens is, we live right down the street from a high school that my kids could walk to but they don't go to because of it's -- it's a struggling school. It's not succeeding. But all the kids from the other side of town are bused there. We've got -- busing is everywhere here. And I'm wondering, why not spend that money to coop a school with another school or put all those resources into the schools and to the neighborhoods that are struggling, instead of busing, so all kids could go to the school with their friends and walk to school with their parents and have their parents be involved and put money back into the communities that are struggling instead of busing. AUBREYThank you for the call. Gerard Robinson, this idea of let your kid go to the school in their neighborhood. ROBINSONSo when the Supreme Court was trying to figure out a remedy and trying to give a nod to local federal judges who had to put together a plan, in some places you simply had to put kids on a bus, particularly in the rural South where there was a spatial mismatch between where a kid attended school and where the nearest school was located that would do well. So there's a role for that. But there are a number of people who are questioning whether or not we should reinvest the money. Kansas City, an example of where over a billion dollars was spent trying to integrate/segregate, however you want to call it, with mixed results. ROBINSONSo, no, there's simply some times where you have to use the bus. But what we should also think about is the use of technology. Rather than simply putting all the children on a bus, why don't we use technology, handheld devices and computers, to actually bring the education and learning resources to them where they are? So there's a role for technology in this as well. AUBREYEmma Brown, role of technology? BROWNWell, actually, I want to go back to the busing question, because we've had, you know, this controversy here in D.C. recently, not with busing but with getting rid of neighborhood schools, the idea that perhaps we should do away with them to have more diversity. And people are really tied to their neighborhood schools. AUBREYOkay. Coming up, your calls and questions. Stay with us. We'll be right back. AUBREYWelcome back. I'm Allison Aubrey of NPR News sitting in for Diane Rehm. We have a lot of emails coming in. This email from Mary Ellen. Would you please address how schools are funded in Pennsylvania? Local taxes pay a large part of the school budget, driving large disparities between low income neighborhoods and high income neighborhoods. A big topic there. Do you want to start us off, Sherrilyn Ifill? IFILLYeah, I do. This is the issue I was raising earlier and I think this is, you know, one that I don't understand why there's not greater attention to this, you know, in 1974 when the Supreme Court decided the San Antonio School District Case, and said that it was permissible to fund their education system based on local property taxes, they essentially enshrined into place the reality that students who live in poor neighborhoods, you know, for no fault of their own, will have fewer resources than students who live in wealthy neighborhoods. IFILLI mean, it, you know, you could drop the microphone right there. That pretty much tells you that there's going to be a disparity and precisely what the emailer described is what happens all over this country. Now, there are funding formulas within the Department of Education to provide supplemental funds to school districts that are struggling through Title 1. But those funds are limited, and until we deal with that systemic inequity between rich and poor school districts, it's going to be very difficult to deal with the issues of segregation and the issues of a disparate academic outcomes that were outlined in this Yale report. AUBREYAnd Gerard Robinson of the American Enterprise Institute, you want to weigh in here. ROBINSONSo, one thing we have to remember is the federal government only invests about 9.2 percent of the funds we have in public education. 45.6 percent will come from state resources, 45.2 percent will come from local resources. And so, this is really something we have to remember that states have a stronger role in this. Yes, there's a role for the federal government, yes, there's a role for federal money, but it's going to take a big push. I would say that the NAACP President mentioned a couple of times Rodriguez. There's a new book by Professor Charles Ogletree and Professor Kimberly Robinson called "The Enduring Legacy of Rodriguez," just published by Harvard Education Press. It's got some of the best advocates, thinkers and lawyers on this subject and it would be a great read. AUBREYThere's an email here from Mike in Oakridge, Tennessee. He says, as a former resident of a suburb of Detroit, I watched my neighborhood flip racially, due to white flight, driven as much by fear of a drop in housing prices as by racism. Within five years, I watched as many of the most upwardly mobile families left our town, taking their children with them, followed by the most capable teachers. What was left behind was a shell of a city with an imploded tax base and struggling schools to match. Richard Rothstein, do you want to weigh in on this? ROTHSTEINWell, yeah sure, I hate to be repeating myself, but, but what your correspondent is describing is a situation where the federal government subsidized those whites to leave Detroit and prevented African-Americans, who had the same incomes as whites, from doing the same. So, it's not -- we call it white flight, and it is white flight, but middle class African Americans also wanted to flee urban areas and were prevented from doing so. All of the suburbs around Detroit were racially restricted by government policy as well as by real estate agents and private actors. ROTHSTEINSo, to blame white flight for it is only very small part correct. If we had permitted African Americans and whites, both to move on the same basis out of urban areas and into the suburbs that the government was creating, we would have integrated suburbs today. And we would have a much more integrated city of Detroit. So, this is an example of policies that were very powerfully implemented by the federal government. And yet, we've forgotten the federal government policies -- we blame it on white racism or fears of property values falling and so forth. ROTHSTEINThis was a powerful government policy -- it's going to take equally powerful government policies to reverse it, to undo it, to integrate our communities. But it's an obligation that we have to reverse a century of really unconstitutional federal housing policy that results in segregated schools. And, you know, I agree with Sherilynn on the importance of the Bradley v. Milliken case in 1974. But, you know, today, most Detroit students who are poor and low income and minority, live too far away from those white suburbs that were created for bussing to -- of any modest size kind of to accomplish integration. ROTHSTEINIn the 1970s, we got to the point where we were bussing children for an hour, hour and a half each way because the white suburbs and the urban minority communities were becoming more and more distant as the suburbanization proceeded. So, I'm afraid I have to keep emphasizing that we're not going to solve the problem of segregation without dealing with housing. And it also relates to the funding issues that we've been talking about. We need much more funding in urban areas, in schools serving minority children. ROTHSTEINBut part of the reason we need so much funding there is because when you concentrate children with severe social and economic problems from low income families in the same schools, the problems become much more difficult to deal with. And if those children were integrated into middle class schools, into schools in the suburbs, of course they would still come with some social and economic problems. But they would be much easier to deal with if teachers didn't have a whole classroom full of children with those kinds of problems. ROTHSTEINSo, these things are related. Segregation and the funding issues are related. It's not -- you can't separate one from the other. AUBREYCertainly. Wrapped together. We have a call from Mimi in St. Petersburg, Florida. Mimi, you're on the air. MIMIGood morning. I've been listening to what everyone's saying and I think it just reinforces what I have found in my years of working with students, teaching GED. In our area, there's a lot of fear among our young students and among the adults, I mean, I see older adults. They enjoy the security of living with and being near people that they can relate to. They go to the same churches, they can help one another. When you have a young mother who has just taken her kids to the daycare or dropped them off at school and she's ready to go to work. MIMIAnd her car won't start. If she gets a voucher to live in a different neighborhood, she's going to be less hesitant, or, I'm sorry, more hesitant, to go to her neighbor and say, I'm having a problem with my car and that neighbor -- whereas the neighborhood she grew up in, they're like, oh, don't worry. You know, we'll get you there, okay. Or, you need this or hey, I'm short of money to pay the rent this month. AUBREYSure. So, it sounds like -- thank you so much for that call. It sounds like you're really getting at this theme again of community people want to go to school in the community where they live, where they worship, where they spend their time. Gerard Robinson. ROBINSONIf you want to see how important school is to a community, try to close it. ROBINSONNow, you could just imagine people who will often go to the high school one time a year and that's for homecoming. Often won't invest human resources, capital resources into the school. But at the moment we decide we're going to close the school either because it's under enrolled, because it's not providing a quality education to students, all of a sudden, people want to come up in arms and say, hey, this is the wrong thing to do. So, neighborhood matters, but having worked in this field for 25 years now, what matters a lot to families are schools that work now. AUBREYWe have an email here from John in State College, Pennsylvania. He says, hasn't the diversification of the American immigrant population had an impact on these neighborhoods in more recent years and is thus being considered in discussing civil rights in schools. Beyond African-American and Latino students, there are now more Asian Americans in lower SES homes, socioeconomic status homes, and subsidized housing than ever before. Do you want to weigh in on this, Emma? BROWNWell, the GAO report really didn't look at other populations, so this was focused on schools with high proportions of black and Hispanic students. So, your, the email writer raises a good point, that missing from our conversation so far is, is the huge diversity of other minority populations in our country. ROBINSONAnd even within the black population, approximately eight percent are immigrants from Jamaica, from Haiti, from West Africa, and there have been scholars, I think he's deceased now, John Ogbul (sp?) and Cynthia Fordham (sp?) and others who've actually found different achievement rates when you compare African Americans to Africans or Caribbean students. Another story. AUBREYGot it. Got it. So, we have a call here from Daffney in Harrisburg, Pennsylvania. Daffney, you're on the air. DAFFNEYGood morning. I came from Greece when I was almost 10. I didn't know a word of English. And the school that I went to in Greece was in a village. We had no bathrooms, no carpets, no anything. The only thing that was in the room was the seats, the stove where we brought pieces of wood to warm it up and the teacher's desk. And there were like 45 students. But, from those schools, people came out because, and were successful because there was an attitude within the family and within the community that the student is supposed to do his best. DAFFNEYNow, my cousin came from there. He has been head of the Physics Department at Boston University for years and very successful. I mean, I went to public schools here with all the colors of people and I am against segregation. But there's no reason why -- and we keep labeling these schools as poverty schools and poor people schools. We shouldn't be doing that. We should expect the best from those students. And the parents have to be part of it. And give them the best teachers and with all the technology that is available today, every school should be treated the same. DAFFNEYBecause I -- I live in a suburb now and I see -- my kids already graduated and stuff. And they had all these extra things like carpeting and, you know, libraries and stuff. I mean, I succeeded, my, you know, all the people that I know have succeeded without all those extra things that were in the schools. It's a mental, it's a cultural thing. DAFFNEYWe have to -- everybody has a brain. AUBREYGot it. Thank you. Thank you so much for that call. The idea here that poverty doesn't have to mean poorly performing schools, Sherrilyn, do you want to weigh in on that? IFILLI do, because I think many of us of my generation and older focus on this issue and approach it from a (unintelligible) about what it was like when we went to school. I was bussed to school in New York City and attended integrated schools as a result and had a great experience. But I came from a very different neighborhood than the way neighborhoods are configured now. And part of what you see in the GAO report is that they're talking also about the increase of concentrated poverty. What we discovered in our litigation, for example, in Baltimore, are the ways in which neighborhoods are living in deep distress. IFILLA concentration of poverty that did not exist in the way that it does now 30 or 40 years ago when even though you were poor, and maybe your next door neighbor was poor, the neighbor next to them was not poor, was middle class. Maybe your parent was a teacher and across the street was a mechanic. Our neighborhoods were much more economically diverse than they are now. And because we now no longer have economically diverse neighborhoods, we have a stark disparity between neighborhoods that are wealthy, neighborhoods that are poor. IFILLYou're dealing with levels of concentration that produce the kinds of results that I think Richard referred to earlier, in terms of the needs of the children, that place pressures on the parents that are unbelievable and beyond what we could imagine. And create a situation in which the schools are faced with children who have tremendous needs. And those needs require resources, resources not just in terms of funds and money, but resources in terms of specially trained teachers, certified teachers, counselors and so forth who can address some of those problems. IFILLThat's what we're faced with today, and until we remove ourselves from nostalgia and confront the children, the communities, the schools that we're confronted with today, we're not going to be able to tackle this problem and all its dimensions. AUBREYI'm Allison Aubrey of NPR News. You're listening to the Diane Rehm Show. I want to take a tweet here, talk about this tweet from Andrew. He says, do school funding mechanisms need an overhaul? Are there examples of spreading the wealth of tax dollars across districts? Do you want to weigh in on that, Emma? BROWNThere are states where -- that contribute much more to local school budgets than other states. So, if you look, the federal government and a couple of non-profits have looked at this more -- have looked at this very closely, and there's a huge spread. There are, we know, when a state contributes much more to schools then that sort of can equalize, right, the difference between what tax payers in poor neighborhoods are able to provide verses tax payers in much wealthier neighborhoods. BROWNSo, there are, there are states that do a pretty good job of providing more for low income schools. And then there are states, like your previous email writer from Pennsylvania, that do not do a great job, that actually provide -- that where state funds have been cut so much, particularly during the recession, and then were never restored, that that put a huge burden on local tax payers and increased the gap between what was available for students in low income neighborhoods verses what was available for those students in more wealthy neighborhoods. AUBREYGot it. So, a lot of variation there. We have a number of emails from people asking about northern cities. I guess the South has come up a lot. This is not just about the South, they say. Aren't cities like New York City extremely segregated? Sherrilyn Ifill, you mentioned you grew up there. Talk a little bit about New York and other big northern cities. IFILLWell, New York City, you know, the population is 25 percent African-American, but 65 percent of black students in New York attend black schools. 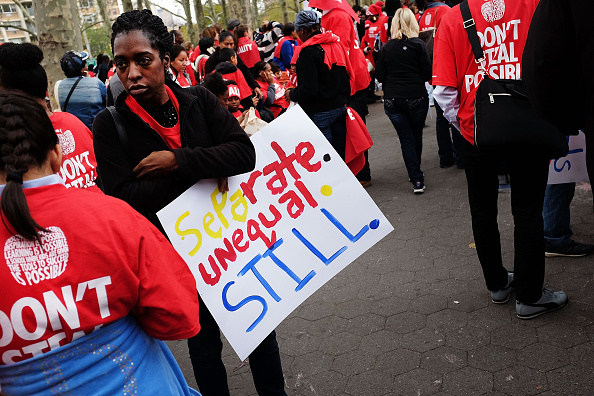 New York is regarded and has been reported to be the most segregated city in the country. So, we're not talking about a South verses North, but there are differences in the physical domain and geography from South to North. But there's no question that northern school districts are segregated, and this goes back now to some of the issues that Richard was raising about how did northern districts come to be configured as they are? IFILLHow does white flight play into this question? This is something we haven't talked about at all. The passive voice that's been used, you know, racially identifiable neighborhoods, I think Gerald said earlier, I object to that term, because it is an entirely passive term, as though racially identifiable neighborhoods were not made by very specific identifiable choices made by government and made by individuals. And that's what we see in the North. We see in the North the result of government policy through HUDD and through other agencies that compelled segregation in many instances. IFILLAnd we also see white flight that created the suburbs around those cities that exacerbated segregation. And we see education policies that have a disparate effect on poor school districts. I want to direct some of the callers, since there are so many and emails, to a couple of websites. One is our website, the NAACP Legal Defense Fund's website. But also the National Coalition on School Diversity, which really tackles all of these issues and has policy reports and has all kinds of research. And identifies school districts that are doing innovative things to try and deal with the problem of segregation. IFILLAnd I would direct people who are really interested in tackling this problem and learning more about it, to go to the website of the National Coalition on School Diversity and then begin to advocate within your own community for the kinds of changes they're identified. AUBREYGot it. So, as we wrap up here, I want to ask the panelists what does all of this mean, the new GAO report, for the legacy of Brown v. Board of Education? Does it take anything away? Do you see Brown -- do you see that decision, Brown v. Board as -- what's the legacy? Is it a failure, Gerard? ROBINSONNot a failure at all. I probably wouldn't be sitting here in Washington D.C., having this conversation with you if it did fail, as a black man. So, no, there's some things it's done well. The takeaway for me are two-fold. Number one, we know that schools with concentrated poverty have challenges, but let's also talk about the victories. You know, US News and World Report ranked their 2016 high schools. There are 58 gold medal winning public high schools where 75 percent of the students are in poverty. And also, in terms of the passive voice, segregation is still the wrong term to use. We live in a different world. AUBREYOkay. We are out of time. Thanks to all of you for joining us. I'm Allison Aubrey of NPR News, sitting in for Diane Rehm.